We have been moving along in the process with Yeison when in our last step which was supposed to be easy, turned out to be a difficult encounter and a closed door. Thankfully things suddenly changed and we were able to get the ball rolling with the lawyer. Lord willing, if we can get this part finalized he is legally ours, praise the Lord! This has been a long time coming, please pray. Getting him a passport is next, then once we have applied for the passport and have a number for him, we can apply for a visa to travel. The guardianship allows us to travel with him anywhere, but the visa to travel back home depends on the US embassy, if they approve it and for how long totally depends on them. Please pray for this! Lord willing, we hope to bring him with us to visit in the summer IF we can get it done in time. This will be the first time our family will be able to travel together since Yeison came into our lives and we long for our families to finally meet him as well. We have three people in the church that have had some serious health problems. Two have had emergency operations and are doing well. The third is a sister named Fidelina. She just discovered she has stage three breast cancer. Christen and I spent some time with her yesterday. We have prayed over her at church before her surgery and have been praying for her when we meet. I was preparing myself for our visit to minister to her during this challenging time. What happened completely surprised me and we left there blessed and ministered to instead. This is what a walk with Christ should look like. This is what the Spirit of God does in a person despite undesirable circumstances. This is what it means to have an eternal perspective. Her testimony is inspiring and encouraging. Please keep her in your prayers. Pray. The Lord has been working in the hearts and lives of the people in the church. This past Saturday we had the privilege of baptizing five people, one of them being Sahira, the teenage girl who has been living with us for a while now. It would have been six, but one sister could not go to the river with us because her infant daughter became ill. We will be baptizing her very soon, Lord willing. It was certainly a time of rejoicing and beautiful fellowship as each person gave their testimony before going into the waters. Three of them are part of a family from Venezuela that immigrated to this country as unbelievers. We are now recording videos of their testimomies to share. It is titled “From Venezuela to the DR to Christ”. They share stories of the very sad state of their country and families and how they realize that the Lord used all the suffering and economic crisis in their land to bring them here for the purpose of knowing Christ. We will share them on social media and with future newsletters. Beautiful, God glorifying testimonies. Praise the Lord! We were finally able to replace the termite infested wood beams and old rusty tin roof on the church building. God truly has been providing and answering many prayers lately. He has been so gracious and kind, blessed be the name of the Lord. Please pray for the many outreach activities we have planned in the community in the coming months. Next Saturday the young people in the church will be doing a children’s outreach in the barrio. They are wanting to step up and serve more, praise the Lord for that. Please also pray for wisdom in deciding the right timing for a much needed furlough. Although we hope to visit in the summer it will be a short visit. We will be visiting family, hoping to raise some much needed support for this ministry and for the pastor’s fund which will be to help those the Lord is raising up for ministry in the future. Pray that the Lord will touch brothers and sisters to help in this important area of ministry. This is a vital step in Hato Mayor becoming a sending, church planting church in the future. We hope to be able to raise these funds to financially assist for a time so that these men may dedicate themselves fully to being discipled, focusing on spiritual disciplines, study of the Word and prayer. But we still need to meet what we are short in the budget for our children’s schooling, and health insurance as well. Please pray for these needs and consider helping if you can. Pray for our marriage, pray for our children, pray for the church, and pray for the lost that we meet. May God be glorified as we continue to take the Gospel of the Lord Jesus Christ to the people of the Dominican Republic. Pray. Here are just a few of the things that the Lord is doing here in the DR.
We are very pleased and praising the Lord for the growth and regenerating work of God in a some of the people we serve here. Lord willing, be baptizing up to five people very soon. There is an obvious change in their lives and it has been a beautiful thing to witness. Three of them are a young family from Venezuela that immigrated here four months ago because of the economic crisis there that is growing worse every day. They arrived to the DR each with just a small bag of a few articles of clothing, nothing else. The church has come around them and helped in many ways. The love showed to them through this difficult and traumatic transition made an impact on them that the Lord used to bring them to Christ. They are now growing and wanting to serve and fellowship whenever they can. Praise the Lord! We sat with them today after church to spend time and just listened to their story, and how although they are very concerned with the state of their country and their family there, they are very thankful, and see God’s purpose in bringing them here. One of them, is a man named Rafael who also speaks English. His exact words were “I am just so thankful to Jesus Christ for everything. I didn’t know what to expect and we were all very sad to leave Venezuela, but now I understand His plan in all of this.” We are now planning a wedding and their baptism. Praise the Lord! 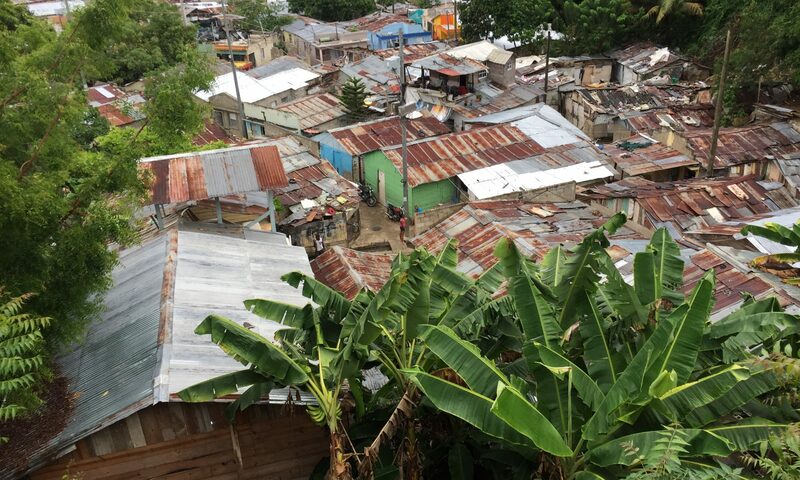 We have still been visiting the area of Santiago known as Frakatán (in the image above) to share the Gospel and visit with those who lost almost everything in the flooding a couple of months ago. Saturday we held an outdoor church service there. Since we have been visiting, an older couple has begun visiting the church. At one of them come every Wednesday or Sunday. We are praing that they will be instrumental in reaching more people in that area with the Gospel. Please keep Frakatán in prayer. There is also still a group going to Cotuí every two weeks. Although I personally have been going a liottle less often, the group from the church that goes has been growing and more are showing interest in visiting there and helping minister to the people. Please keep Cotuí in prayer as well. We have begun a monthly movie night at the church where we show christian films. It not only gives us more time to spend together, but also a chance for the brethren to invite friends and neighbors. The first night we had 60 people show up! Kelvin and I both got up afterwards and shared a few words. All the visitors heard the Gospel before leaving that night. Pray for more to come and be exposed to more of the Word and the love of our people. Our group of men is growing and that is very exciting. Since we began working in Hato Mayor, one of my most frequent prayers has been, “Lord, please send us men.” That prayer is truly being answered right before our eyes. God is faithful! When God tells us to pray specifically for things in His Word, do it, He will answer. There are few very promising men in the group we have a lot of hope for as far as deacons and leadership. They have been growing and very helpful serving any chance the get. They get it. They understand that true faith works, it bears fruit unto the Lord. Please pray that the Lord continues to grow them in faith, knowledge, and grace and for the Lord to send more men still. In our experience, it seems that the women are easier to reach then the men, but many times they come alone or with young children and struggle more in bringing their families. But more often than not, if the men come, they are going to bring their families with them. It isn’t always that way, but that seems to be the pattern we are seeing. The group of ladies at the church is also growing. They seem to be more united they are becoming more organized and wanting to serve more. Praise the Lord for that! There has certainly been struggles, hardships, and difficult decisions to make. God is always dealing with His people whether it be discipline, trials, or just His pruning. Stripping away things we don’t need, showing us the idols of our hearts, teaching us to trust Him, teaching us to recieve our joy from Him rather than things or people. All for the purpose of His glory and preparing us to bear more fruit for Him. The enemy is also very crafty and deceptive, never far away. Please pray for the familes, especially the marriages. Pray for the salvation of those among us who still have not been born again, especially the children. Also pray for unity among the brothers, growth in love and humility, and stonger desire for the Word and obedience motivated by love, and wisdom. There is so much more to share. We have finally gotten closer to obtaining Yeison’s birth certificate. We have had his mother diagnosed by a psychiatrist stating why she is unable to care for him. Please pray for the many more steps in this process of legal custody and getting a passport and possible visa for him. We have done what we can on our own, but there are things that only a lawyer can do. We will definiotely need a lot of support financially to be able to make that happen, it is not cheap at all. We are confident the Lord will provide it. Please pray that the Lord will move people to be generous and give towards this important need. We pray that we will be able to take him to the States one day to visit family and the many people who have prayed for him and our family during these last three years. We still visit and minister to the orphans every Tuesday. We are planning our activities for the year, hoping people will come to teach for conferences we are organizing, minister to us, as well and bring much needed resources if possible. Please pray for the Lord to help us arrange all of this. We need more transportation. Many of the people, including the new ones do not have any transportation. We are praying for a large van or mini bus for the church. We can certainly put something like that to very good use here. We have spoken to a lawyer who is also a friend and employee of customs at the port here and he is confident he can get it into the country for us if one was sent or donated. Pray for that! We are also working on finally replacing the roof to the church building. Praise the Lord! We are very thankful for the generous brothers and sisters back home who made that possible. Those who pray and give to missions, play a role just as important as those on the mission field. I can go on and on with prayer requests and praise reports, but I will end this one with this. Our family hopes to visit the states in the Summer. Please pray for the funds needed to do so, and for the Lord to open doors to new mission partners, opportunities to share this mission with more churches and individuals back home that will enable us to continue to minister effectively here and hopefully do more to reach more. Please also share this newsletter and the many prayer requests with others. We are thankful for each and everyone of you who pray and support our family and the ministry here in the DR. Thank you and God bless. 2016 has flashed right before our eyes. Here we are in December now getting ready for Christmas and New Years. Many families plan their get togethers and enjoy some time away from work and school. It is a time of the year that we remember the miracle of the incarnation of our Lord. When God Himself stepped into time and His own creation , took on a robe of flesh and came to rescue an otherwise hopeless people from their sins for His own glory. I pray that we all make time to block out the noise of materialism and busyness to meditate on these important and beautiful truths and to be thankful for God’s glorious grace. Life still continues almost the same here for us. Please remember to pray for our family and the many other missionaries around the world who can’t be with their families or at those special reunions at this time of year. There are many other prayer requests as well. After 3-4 years on the field, many missionaries come home for a furlough. There are several different reasons for this. Fundraising, medical reasons, reporting to home and supporting churches, and rest. We have now been here 4 1/2 years. Many missionaries take a furlough after a term of 3-4 years on the field. Please pray for provision and wisdom in this decision. We also are about to begin fundraising for some important legal paperwork towards working on some very important steps with Yeison, including a passport and visa. We are praying that with the lawyer we will soon be meeting with, Lord willing, Yeison may finally be able to travel with us. Even if it is just for a short time in the beginning. But it will be quite costly and depends on what this lawyer says. We are hopeful and This lawyer has a lot of experience with the process. If the meeting goes well, fundraising that kind of money will also be difficult from this side. This is another reason that we would need to be home for a time. We hope to share this need and other needs with many churches and individuals. Please help us pray for this. Yeison is very much our son and deeply loved. Machetes are a commonly used tool here. But anyone who has had to use one to chop for any amount of time would tell you, they work best when they are nice and sharp. You exert little energy and can work efficiently for extended periods of time. But over time and with much use, the blade begins to dull. If one continues to use it that way you must exert more and more time and energy as the blade loses it’s edge. In the end you are bound to become exhausted. The wisest thing to do in that situation is to sharpen the blade. But to do so one must step away from the task for a time. We are now praying about that time so that my family and I may sharpen our proverbial “blade”. We understand that this is an important, necessary, and healthy thing for us as a family, and for our longevity on the field to be able to better minister to others in the future. Pray for wisdom in this decision and continued provision during that time. There are some wonderful praise reports too. This month, by God’s grace we had three more people join the membership of the church. Praise the Lord! We are also seeing some tremendous growth and committment in some of the brethren, especially brother William. Brother Kelvin’s daughter (Genesis) is growing and is healthy and strong. And sister Rosalina’s new son (Daniel who is about a month old now) is also healthy and strong. Two beautiful blessings from God to two godly families at Hato Mayor. More of God’s glorious grace. In November I was in Haiti with brother Moises and helped him take some money, food and supplies to his mother and brothers in a remote area in the mountains. Please keep Moises in your prayers. He is in Santiago with us but still struggles a little as he is now adjusting to life on his own as a young man now. We keep a close eye on him and he is in our church as well. We also still help him in every way possible with the support of the brethren. Recently, a brother in the church was able to give him a job. That has been a long time prayer but the Lord now has answered that request. Praise the Lord! Please pray for us and feel free to share this newsletter with others. Giving is very low around this time of year and we still have a ways to go to meet our budget just for our family. There are many ministry needs too. Between the demands of a growing ministry, inflation, and men needing training for ministry, we need to raise some money for a pastors fund which will financially help the gifted men and their families who are candidates for ministry so that they can can focus on studying, growing and learning many other things as we prepare them to minister in the future. This is a vital and important step in becoming a disciple making and chuch planting ministry. That is our deepest desire as a ministry. Lord willing, in the future Hato Mayor will become just that for God’s glory alone. Pray. Dear friends, mission partners, brothers and sisters in Christ. First and foremost we want to express our extreme thankfulness to the Lord for His faithfulness in providing for our family’s needs. But we also want to thank each and every person who prays for and financially supports this ministry. Thank you for responding to the call to missions. We understand everyone cannot pack up and leave their country to serve the Lord and preach the Gospel overseas, but all believers are certainly called to be involved in the Great Commission with equal passion both at home and overseas. Some go, some send. And those that pray for and give to missions play a role just as important as those on the mission field. Brothers and sisters, the Lord has used your prayers and sacrificial giving to keep us here as we just celebrated four years on the mission field just last week! We have seen the Lord do many things. We have learned so much and grown in so many ways. Thank you for your partnership in the Gospel. I pray that God has been, and will continue to be glorified! We are consistently going to the orphanage every Thursday for the children’s Bible study. Most recently we have been helping to get the lice there under control. We are currently expositorily preaching and teaching through the Gospel of Mark and the book of James. We have men and women’s Bible studies every Saturday and have been concentrating on working through the church member’s families and neighbors and friends in our evangelism efforts. We see the Lord using this moreso than some some of our past evangelism strategies. This is also where many of the new faces in church are coming from lately. We recently reached out to some prostitutes in the city through the sisters in church and a sister that was visiting who has experience working in this type of ministry. We had six women and some of their children come for a special meal we prepared for them as a group of christian women served them and loved them before they received a message from sister Stephanie who was visiting from New York. We had the privilege of baptizing two people this month and have two weddings planned. We had the opportunity to go to Barahona to join in the work of a group we know and back to Cotuí to do evangelism and preach the Gospel during outdoor services that we held there. We have been bringing the handicapped girl from the neighborhood (who for a long time has professed to be an atheist) to church for a few weeks now. She recently lost her grandfather and we have been there with her and the family during that difficult process and had the opportunity to minister to him as well during that time. This encounter with death so close to home has brought her to a place of rethinking things. She is coming to church…and she is liking it! We pick her up and take her home. It is very possible she has been converted, praise the Lord!! Pray as we will be paying her a vist at her home tomorrow as we are out following up with some and visiting others for the first time. There ares so many things going on, it is challenging. Pray for me, pray for our family, pray for the church. The Lord is certainly working and we have the great privilege and honor of serving Him. In all we do, the verse that continually comes to mind is Luke 17:10. This last month has been so packed with activity it is difficult to know where to start. For this was certainly one of the best months during our time here for several different reasons. In the beginning of June we had a small group of five brothers and sisters from Texas visit us to hold a conference on the power of the Gospel. It was a wonderful time of Christ centered fellowship, preaching and worship. The brothers who preached did so in such a clear and powerful way. They were gifted in ther articulation and presentation of the glorious truths of the Gospel. We took them around the community of Hato Mayor to share the Gospel with several people and we even took them to our mission in Cotuí for a couple of days. It was nice to see their servant hearts and go with the flow. Even without fans, electricity, running water, and even a trip to the river after running out, to fill water tanks by hand using buckets. Mission stuff! We have done several other outreaches here in Hato Mayor. We have been able to bless a local little league with lots of baseball equipment and share the Gospel with the coaches and children. We hit a men’s basketball league in the area and shared the Gospel with over 30 men at a time and gave away 5 basketball and some gym bags. We gave away large boxes full of clothes, toys and flip flops while afterwards sharing the Gospel with them. By God’s grace we have been able to share the Gospel with at least a couple hundred people this month! To Him be the glory! Our desire is to passionately continue to pray for and completely saturate this community with the Gospel. The Lord is now bringing new people in on a regular basis due to our engaging in conversation with people during our time out and helping meet needs. These are exciting times. Please continue to pray for our evangelism efforts. In our last letter we asked for prayer about a young lady we were considering taking in due to a troubled past. There are actually two youth at the church like this, both at a very sensitive age and in need of the Gospel, love and stability. One of them is now living with us and the other spends much time with our family as well. We are now enrolling them in a better school to give them a fresh start and to get them away from bad influences from their past. They are very close to Christen and our girls now and our family seems to be growing almost overnight lately. Pray for us that we will be able to live out the Gospel before them and for the Lord to provide for us to be able to help them in every way possible. We are raising money for them and are getting a good response, but we still have quite a way to go for our children’s schooling as well and the school year is approaching quickly. Please pray about giving. Our oldest daughter Trinity is in Peru as I write this. She was presented an opportunity to go and serve with a team and the Lord provided completely for her to do so. The Lord reminds us that He is gracious and kind in His provision. This is the first time she has been away from us like this and we miss her dearly but it brings joy to our hearts that she is always eager to serve. I pray that God uses this time to give her a passion for the nations. Trinity just turned sixteen last month but she is already expressing a desire to be a missionary after some medical schooling. I pray that our children would not get distracted and waste their life getting entangled with the things of this world but rather go hard for the Lord wherever He may lead them and whatever it may cost them. That is a dangerous prayer but may the Lord lead more parents to pray this for their children so that the He would raise up another generation of Christians serious about their faith, serious about God’s glory, and making His name great among the nations. Pray. It has been an interesting couple of months. As a matter of fact that is a huge understatement to say the least. We have experienced more spiritual attacks of the enemy in recent times than we have in a long while. Attacks on our family in various ways, sickness and depression in several brothers and sisters in the church. Prayers are certainly appreciated in this area for our family and ministry. Even through the dealings of these issues and ministering to and encouraging the brethren here in the midst of difficulties, we are encouraged. We are encouraged because we must be doing something right. I would have more reason to worry that we were not making an impact for the Kingdom if everything was “peaches and cream” all the time. We are seeing spiritual growth in the men of the church, we are still seeing new faces visiting the church from to time through different outreach efforts, we are still visiting and spending time with the orphans at Casa de Misericordia, going out to the mission in Cotuí, as well as some new outreach activities we have planned with local little league ball players as well with sports equipment we recently received from a brother back home who has made that his ministry. We have poured a half court on the church property and have a donated basketball hoop we will put up soon for the children and youth to enjoy themselves. Unfortunately there was a small mistake and it is a bit smaller than it should be but we will be extending it very soon. You just have to learn to be patient and flexible here! We have a couple of brothers visitng us this week who are coming to do a small conference and teach on the Gospel at our church in Hato Mayor, and evangelistic outreach in Cotuí where we will be roughing it for a couple of days far out in the countryside, and go preaching in a prison here too. Please pray that many hear, respond, and most of all for God to be glorified through it all! Yeison just turned two years old in April and is doing good with the boots that the doctors had made for him. In the beginning it was painful for him and he would just lay on the floor and cry, but he has gotten used to them and is getting around good with them on. When we take them off to give him a little break, he is actually starting to be able to put his feet flat on the ground without them for the first time since he has learned to walk. He still has a way to go but he is making improvement and the boots seem to be working well stretching out his tight heel chords. Maya also just turned 14 last week and Trinity will be 16 in just a few days! Time is going by so fast and the kids have grown and matured so much since we moved here in 2012. Please pray for our kids, they are all at a sensitive age and going through so many changes. May the Lord keep them, bless them, and use them for His glory. Please also pray for us as we are seriously considering taking in a young lady needing a stable home and the opportunity to get away from some bad influences in her school and neighborhood. We are good friends with some family members who attend the church who love her very much but are unable to offer her what she needs and they have recently approached us for help. The girl’s father is nowhere to be found and the mother is unable to care for her and is schizophrenic. If this is the Lord’s will we will certainly need help in order to give her all she will need. Please pray about helping us by sponsoring this young lady. Her name is Nayeli Fernandez and some of you who have visited us may have met her. We will be making a decision within the next couple of weeks and keep everyone updated about this situation. Pray. The Lord continues to be very gracious and as always faithful. We have several things we have been praying for and little by little we can see the Lord confirming things and answering prayers. Specific prayers. We are very blessed by the core group that the Lord has brought together since we started this church plant in Hato Mayor. We have been working very hard doing many things like evangelism, discipling those that the Lord sends our way, and very intentionally teaching and preaching Christ as the center of everything. On Sunday mornings we have been working our way through books of the Bible. We started with Galatians and we are now going through the gospel of Mark. This has had an excellent result as we are seeing growth and a better understanding among the brethren about what it means to be the church, and what the gospel is and is not. This is also helping some understand how to read the Bible and study the Scriptures on their own always considering the context. It has been a privilege and a blessing to see the growth in some as their love and passion for the Lord grows and as we can see their level of committment increase. I often say that your committment to your local church reveals more than you think about your committment to Christ. Your committment to your local church reveals more than you think about your committment to Christ. But the best results have come from investing time with families and individuals on a regular basis. We are not simply having meetings or dry regular academic teachings, but we are getting involved in the personal lives of the people. We genuinley love eachother. We spend time with them in their homes, we have weekly men and ladies meetings centered on the Word in different homes each week. We are constantly in communication with one another and regularly helping meet needs as well. The church has become very much like a family and there is trust and love between one another. Praise the Lord for this! On Wednesday nights we have been going through fundamental doctrines about what we believe. This has been a blessing as this was the next step in our working towards organizing ourselves and moving towards membership. This past Sunday we presented the first six official members of Iglesia Bautista De Hato Mayor (Christen and I and four others). We take membership seriously around here. We make it clear that to be a member of the church is a privilege and is for those committed and of good testimony. In many churches here, just going to a church makes you a member regardless of how you live. This has brought much dishonor to Christ and has tarnished the image of churches who are hasty in making members of anyone for the sake of numbers. We take the church seriously because Christ takes His church seriously. We also just celebrated Yeison’s second birthday this past Sunday. He is growing so fast and learning new words every day. He has also had many doctor appointments recently and we will soon finally have the corrective boots for his feet he has been needing. Praise the Lord! Over all we had much to celebrate and to give thanks for this weekend. The Lord is so good and gracious! We are now praying for the Lord to provide in a big way. We have been getting estimates on the expansion and additions to the church building. We hope to be able to expand the sanctuary and also be able to build upstairs. The Lord has put on the hearts of many in the church to minister and help abused, underprivileged, and/or orphaned children. There is definitely no shortage of those around here. We are praying for the Lord to provide for phase one of the project so that we may then have the space prepared which is necessary for growth as a church, and begin to be able to build the addition needed to begin to work with these kinds of children. It is a very big need but we simply do not have the room right now. Even our sanctuary is so small it is full with 40 people.. The piece of land we have is big enough, we are now praying for the resources to begin phase one of a what may be a three or four phase project. Please pray for the Lord to provide for this need. With only $10,000 we can get much accomplished and even complete phase one. Using local labor we can make the money stretch as well as give work to people in the church and/or their family members. This may seem like a lot but the Lord can do much more than we can even think or even imagine! Please help us pray that the Lord would provide for this endeavor and that above all, we may continue to glorify Him in all that we do in Hato Mayor. Pray. If the Lord so leads you to give towards this project or any other need, you can easily give online by clicking on the “donate” button of this page. For other ways of giving simply contact us here or send us a message at salgadodrmission.com. Thank you and God bless.